UN High Commissioner for Human Rights Navi Pillay addressed the UN Security Council on 25 January regarding the situation in Libya. Pillay expressed extreme concern regarding the conditions of detention in Libya faced by thousands of detainees, including a large number of Sub-Saharan African nationals, and called for all detention centres to be brought under the control of the Ministry of Justice and the General Prosecutor’s Office. Amnesty International and MSF have both just released additional reports documenting ongoing torture of detainees in Libya. A related area that I am extremely concerned about is the conditions of detention and treatment of detainees held by various revolutionary brigades. The ICRC visited over 8,500 detainees in approximately 60 places of detention between March and December 2011. The majority of detainees are accused of being Gaddafi loyalists and include a large number of sub-Saharan African nationals. The lack of oversight by the central authorities creates an environment conducive to torture and ill-treatment. My staff have received alarming reports that this is happening in places of detention that they have visited. Click here for Pillay’s Statement. Click here for AI Statement. Click here for MSF Statement. Amnesty International released a briefing paper this morning describing the “totally inadequate response by EU states to refugees” who are stranded near Libya’s borders. AI estimates that there are 5000 refugees currently living in limbo along the borders. 650 Tunisians have been summarily repatriated by Italy to Tunisia under the terms of the Italy-Tunisia agreement which took effect on 5 April. The agreement reportedly allows Italy to return up to 60 Tunisian nationals per day on two flights. Amnesty International’s Briefing Paper of 21 April, “Amnesty International findings and recommendations to the Italian authorities following the research visit to Lampedusa and Mineo”, is highly critical of Italy’s expedited return practice. Click here for AI’s Briefing Paper. Italy has been continuing to deport newly arriving Tunisian migrants pursuant to the terms of its new agreement with Tunisia, the terms of which have not been made public. Under the agreement, Tunisia has apparently agreed to the expedited returns of its nationals from Italy. 300 Tunisians were flown to Tunisia from Italy last week. The mayor of Lampedusa, Bernardino De Rubeis, declared that the “immigration crisis” on Lampedusa is over (only 27 migrants remain on the island as of 26 April). The mayor called for the 500 extra police and military personnel who were brought to the island to deal with the migrants to leave as soon as possible so that tourists can use the hotel rooms currently occupied by the security personnel. 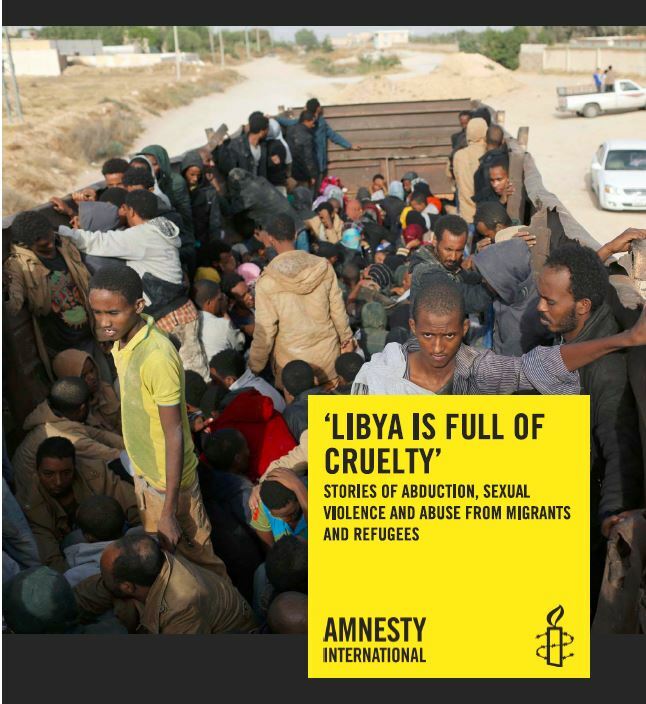 Amnesty International issued a Briefing Paper on 21 April: “Amnesty International findings and recommendations to the Italian authorities following the research visit to Lampedusa and Mineo.” Amnesty is highly critical of the expedited return practices that have been implemented by Italy. “Collective summary removals, reportedly of Tunisian nationals, from Lampedusa, from 7 April 2011 onwards, following the signing of an agreement between the Italian and Tunisian authorities. Amnesty International is extremely concerned by the enforced removal that began on 7 April from Lampedusa, following the recent signing of an agreement between the Tunisian and Italian authorities. At the time of writing these forcible returns were ongoing and had reportedly been carried out twice a day by air since 11 April. On 6 April, the Italian Ministry of Interior announced that Italy had signed an agreement with Tunisia pursuant to which the latter committed itself to strengthening border controls with a view to preventing departures, and to accepting the speedy readmission of people who had recently arrived and who will be arriving in Italy. Amnesty International is particularly concerned that, according to the above-mentioned announcement, Tunisian migrants arriving onto Italian shores may be “repatriated directly” and with “simplified procedures”. In the light of this announcement, and given, in particular, Amnesty International’s findings in relation to the total inadequacy of asylum procedures on Lampedusa, the organization believes that those people who have been subjected to “direct repatriations” following “simplified procedures” have been victims of collective summary removals. As far as Amnesty International could ascertain, people have been removed from the island within one or two days of arrival. Thus, it appears highly unlikely that they would have had access to any meaningful or adequate opportunity to assert that they should not be returned to Tunisia on international protection or other grounds. In the circumstances those removals would amount to summary expulsions (cf. the judgments of the European Court of Human Rights in the case of Hassanpour-Omrani v Sweden and Jabari v Turkey). Such practices are strictly prohibited under international, regional and domestic human rights and refugee law and standards. Additionally human rights and refugee law and standards require that the removing state must provide an effective remedy against removal. Removing people without giving them the chance of exercising their right to challenge their removal through an effective procedure gives rise per se to a human rights violation. This is independent of whether removal would place the individuals concerned at a real risk of serious human rights violations, which, in turn, would constitute a breach of the non-refoulement principle. Click here for Amnesty’s Briefing Paper. At the end of a two day visit to Tripoli, 4-5 October, Cecilia Malmström, European Commissioner for Home Affairs, and Štefan Füle, European Commissioner for Enlargement and European Neighbourhood, signed a “migration cooperation agenda” with Libya. The European Commission issued a Press Release with details of the negotiations and signed agreement. In the framework of the visit an agreement on a migration cooperation agenda was signed yesterday evening in Tripoli by Commissioner Malmström, Commissioner Füle, M. Moussa Koussa, the Secretary of General People’s Committee for Foreign Liaison and International Cooperation, and M. Yunis Al-Obeidi, the Secretary of General People’s Committee for Public Security. This is a Cooperation agenda between the European Commission and Libya, including concrete steps on border surveillance system, mobility-related issues, smuggling and trafficking in human beings, and dialogue on refugees and international protection. Commenting the signature of the Cooperation agenda Commissioner Malmström said: ”It is my objective to put the protection of fundamental rights of all people involved in migratory and asylum flows at the centre of our efforts in the EU relationship with Libya. The Cooperation Agenda will enable us also to promote initiatives aimed at better protecting and assisting the rights of migrants and refugees’. Libya and the EU will work together in the implementation of the “Declaration of Tripoli on Migration and Development” of 2006, and the EU-Africa Migration, Mobility and Employment Partnership adopted in Lisbon in 2007. Providing decent treatment, reception and assistance – in line with international standards – to irregular migrants intercepted or readmitted or to be returned by Libyan authorities, or stranded in Libya, with focus on migrants belonging to vulnerable categories (like unaccompanied minors, victims of trafficking; pregnant women, and families with small children). This could build on the activities already carried out in Libya by the local authorities, international organisations and NGOs. Click here for full European Commission Press Release. On 21 September ECRE and Amnesty International released a 30+ page joint briefing on the 24 February 2010 European Commission “Proposal for a REGULATION OF THE EUROPEAN PARLIAMENT AND THE COUNCIL amending Council Regulation (EC) No 2007/2004 establishing a European Agency for the Management of Operational Cooperation at the External Borders of the Member States of the European Union (FRONTEX),” COM(2010) 61 final. 2. The legal framework governing Frontex – The proposal clarifies the legal framework of Frontex operations by stating explicitly that its activities are subject to the Schengen Borders Code and should be undertaken in accordance to relevant international and EU law, obligations related to international protection and fundamental rights. Sea border surveillance activities fall within the remit of the Schengen Borders Code, even if implemented in the high seas, and as such must be conducted without prejudice of the rights of refugees and other persons demanding international protection. The Council Decision setting out rules which apply to join sea operations further clarifies that all aspects of these operations, including interception and disembarkation, are subject to international obligations arising from refugee and human rights law. While meant to deal with Member States’ disputes over responsibility, the Council Decision also includes non-binding guidelines, which must form part of the operational plan drawn up for each Frontex operation and state modalities for disembarkation of persons intercepted or rescued. Yet, these are not detailed enough to ensure that sea operations will meet the requisite standards. Amnesty International and ECRE recommend that the new Frontex Regulation includes an explicit requirement that the rules for interception at sea operations be formalized in the operational plan. Moreover, they should be accompanied with detailed measures to ensure that disembarkation meets the requisite standards, in particular by specifying the place of disembarkation and as regards the provision of food, shelter and medical care, as well as access to asylum and protection from refoulement. Click here for the Joint Briefing. Click here for the Proposed Amendment to the Regulation. Amnesty International has released a comprehensive report on Libya entitled “Libya of Tomorrow – What Hope for Human Rights?” The report covers a range of matters including the criminal justice system and the use of the death penalty. Section 5 of the report (beginning at p 91) addresses the rights of refugees, asylum-seekers and migrants. The report was finalised before the recent decision of the Libyan government to close the UNHCR office in Tripoli. Members of the EU have been actively seeking the collaboration of Libya in controlling the flow of migrants to European shores – turning a blind eye to Libya’s dire human rights record, the absence of a functioning asylum system in Libya, and persistent reports of the abuse and ill-treatment of refugees, asylum-seekers and migrants. The Treaty of Friendship, Partnership and Co-operation signed in August 2008 between Italy and Libya includes provisions for bilateral efforts to combat “illegal migration”, facilitated by the joint patrolling of the sea agreed upon in December 2007 in the “Protocol” and the “Additional Technical-Operational” Protocol”. As part of the agreements, Italy promised to compensate Libya for its occupation of the country between 1911 and 1943. The Treaty of Friendship, Partnership and Co-operation involves a US$5bn package for construction projects, [and other items]. In return, Libya agreed, among other things, to tighten control of its territorial waters and accept disembarkation on its soil of individuals intercepted at sea by Italian vessels. Italy was also reported to have undertaken to provide resources, including technology, to control migrant flows through the southern borders of Libya. In fact, Italy has provided Libya with six motor patrol boats since the Treaty entered into force. In the framework of these agreements, from May 2009 onwards Italy started returning refugees, asylum-seekers and migrants intercepted in international waters to Libya. On 6 May 2009, distress calls were sent from three vessels with an estimated 230 third-country nationals on board. Italian coastguard vessels intervened but transported the individuals to Tripoli, without stopping in an Italian port and without checking whether any individuals on board were in need of international protection or basic humanitarian assistance. Further interceptions and returns occurred in the subsequent months: according to official information from the Italian Ambassador to Libya, between 6 May and 3 September 2009, over 1,000 individuals were returned to Libya. They included nationals from Eritrea, Somalia and other sub-Saharan African countries. The Italian Minister of the Interior Roberto Maroni was reported to have called this action “an historic achievement after one year of bilateral negotiations with Libya”…. Despite these pleas by UNHCR and consistent reports of abuses suffered by refugees, asylum-seekers and migrants in Libya, the Italian authorities continue to intercept vessels at sea and send them back to other countries most notably Libya. In January 2010, Italian Minister of the Interior Roberto Maroni stated that the number of migrants arriving to Italian shores was reduced by 74 per cent in 2009 compared to 2008, attributing the reduction to Italy’s bilateral agreements with Libya. Italy is not alone in seeking Libya’s cooperation to control the flow of migrants to European shores. Negotiations between Libya and the EU over a Framework Agreement started in November 2008 covering the control of migration, among other issues, including potential readmission agreements for third-country nationals who have transited through Libya on their way to Europe…. UNHCR [prior to its recent expulsion from Libya] and its partners have also been involved in screening individuals pushed back to Libya from Italy. UNHCR declared that by October 2009, it had been able to screen 890 people and had registered 206 of them as refugees and secured their release from detention. UNCHR also registered 80 individuals pushed back from Italy in November 2009, granting 40 of them refugee status. The remainder were awaiting their interviews for refugee status determination at the time of writing. UNHCR confirmed that a total of 685 individuals determined to be refugees or asylum-seekers were released from detention from 2008 to February 2010, including 450 Eritreans and 150 Somalis…..
Click here for AI Press Release regarding the Report. ECRE, CEAR, and Amnesty International have released a joint statement urging EU governments to respect refugee rights as efforts are made to strengthen Frontex.